Hello :) Welcome to A Sampling Bee. Today, I share with you The Hive Box. The Hive Box is a monthly subscription box filled with goodies pertaining to "bees!" Each month, The Hive Box features items such as raw honey, artisan treats, beeswax-based products and bee themed paper goods and home goods. Definitely a subscription box to buzz about!! So, what's in June's box?.. My name, Melissa, means Honeybee. Which is why I love all things "bee". 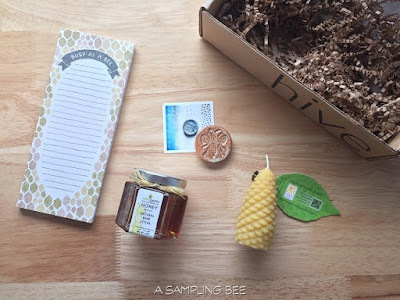 The Hive Box is full of bee themed goodies. All of which I love. All-in-all, June's box is amazing! I keep the Focus Stone in my kitchen. Every time I look at it, it gives me strength and makes me smile. The stone is a little bit bigger than a quarter and easily fits into my palm. I love it. The Beeswax Candle I have in my china cabinet next to a few other beeswax candles. This candle has a light beeswax smell. I love its shape. I am always looking for a notepad, so I was excited about receiving one in this month's box. The back of it does not have a magnet on it. Which would be the only thing that I change. Other than that, I love it and I love the cute design. The Honey is amazing! I love making homemade honey butter so that is exactly what I made with SeedGeeks' raw honey. So delicious. I also love to add a teaspoon to my tea. Each month, The Hive Box costs $24.95. The product value in June's box is $31.94.